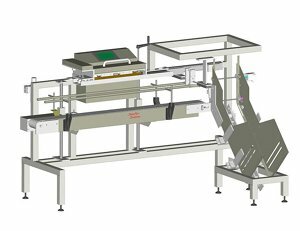 Heat sealing machines that utilize bands to transport the material being sealed through the process have been around for years. This method produces a clean looking seal on virtually all heat sealable films. Shown here are just some of the styles we can offer, designing and building these types of machines is not only what we do. 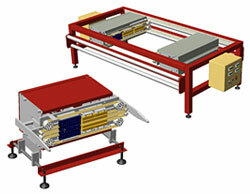 We work with other manufacturers and distributors of related equipment, from filling to palletizing. Together we can offer a complete solution for your bag packaging and or bag making needs. Check out our growing links page for additional solutions! 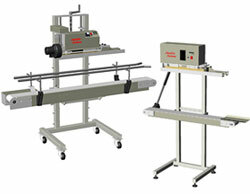 Specially designed machines and systems for other applications can be developed or integrated to suit your needs. SteelNor Systems designs and manufactures its products to provide a very high level of quality ensuring the finish and functionality easily compares to higher priced, competitive products. We do promise years of reliable service! These Steele designed machines continue to prove themselves.